All parents have moments where they feel pride for their children. Last week, I experienced one of those intense bursts of fatherly admiration for Audrey. She had her eye on a new pair of white Converse tennis shoes, and had done some housework in order to earn money for them. “Walmart,” she said with a cringe, waiting for my inevitable reaction. True to form, I did not disappoint. My disdain for Walmart is legendary. Well, among my immediate family and friends, at least. “I thought I raised you better than that!” I said. “But they’re $10 cheaper there,” she countered. “Maybe, but the true cost of doing business with Walmart is not reflected on the price tag,” I told her. We’ve had these discussions before. How Walmart’s business practices leave much to be desired: the annihilation of small businesses, the bullying of suppliers, the reliance on overseas imports, the mistreatment of employees in the form of low wages and a laughably expensive health care plan. My parents, fervent fans of Walmart, argue that they’re not as bad as they once were. They’re paying their employees more these days, they say. Giving back to the community. (I say they’re paying lip service. The Waltons donate little of their personal fortune to charitable causes. And the well-publicized salary increase? Not so impressive when you actually examine it. Let’s just say they have a long way to go to catch up to Costco, about as employee-friendly a company as you will ever find. But I won’t go into all the pros and cons here; just search Google and you’ll find plenty of links that will help you make up your own mind about them. My point is, I hate them with a passion and refuse to ever shop there. So when Audrey was all gung-ho about going there to save a few bucks I was disappointed, but ultimately it’s her decision and I am not one to interfere. …and couldn’t go through with it. Maybe she didn’t use those exact words, but the point is, what I told her sank in and made an impact. My awesome little liberal! She turned around and bought the shoes somewhere else. Someplace that treats their employees with the decency and respect they deserve. She bought them at McDonald’s. Good for her! I have a long standing boycott of a fast food chain, but have yet to convince the rest of my family to take up the torch. Fight the good fight! Which one, if I may ask? Bojangles. I wish I could say my boycott is part of a fight for larger social justice, but it’s based purely on a negative personal experience. The hubby feels I should blame the individual store manager (who is likely not even there anymore) and not the chain, and maybe he is right, but I’ve boycotted so long it is now the principle of the thing that keeps me from going back. I thought you were going to say something like Chik-Fil-A or Cracker Barrel, both of which I would understand! I’ve never heard of Bojangles, but I support your boycott, personal or not. Once a very long time ago, an Arco employee was disrespectful to a girlfriend of mine who later became my wife. I vowed never to buy gas from there again, even though they are consistently the cheapest. That particular boycott is still going strong 28 years later. Just a reminder that Apple Computer is every bit as bad as Walmart when it comes to employee treatment, etc. You don’t support them, do you? That’s the main reason why we have Android phones. Apple has enough of a monopoly as it is! But after burning through PCs I’m probably a customer for life when it comes to the Mac. It’s just far superior than anything else out there. Mine’s a workhorse and dependable as hell. I’m not a fan of their labor practices, either. But there are some subtle differences between the three notoriously employee-unfriendly corporations. Interesting article here: http://www.alternet.org/labor/apple-walmart-mcdonalds-whos-biggest-wage-stiffer. The article concludes by stating, “So who’s the biggest wage stiffer? Apple is by far the worst in rewarding profitability. But Walmart underpays the most people, and McDonald’s pays the lowest wages.” The bottom line is simple: all three could learn a lesson from Costco! If I don’t shop at WalMart because I’m just a snob, does that count? None of your comments were in my spam folder. Remember when I had trouble commenting here about a year ago? I think there’s some issue between blogger and wordpress. Yes, I do remember that. Once in a while I’ll have trouble commenting on Ron’s blog too, so you might be onto something there. I’m with you on unfair labor practices and greedy business practices. Watch the documentary The Dark Side of Chocolate with your daughter. You may never taste a candy bar the same way again. Oh, no. Don’t tell me Willy Wonka is a secret misogynist who employs child laborers…wait. He is those things, huh? Lol good for her! I tend to still shop at Walmart despite all that I know. The few extra bucks right now is the difference between surviving and falling in to debt…I will be fighting the socio economic battles when I can afford to I suppose! Thanks for the emotional camaraderie regardless! You and I are on the same page, though my boycott of WalMart started for different reasons it has continued with their practices piling one on another. 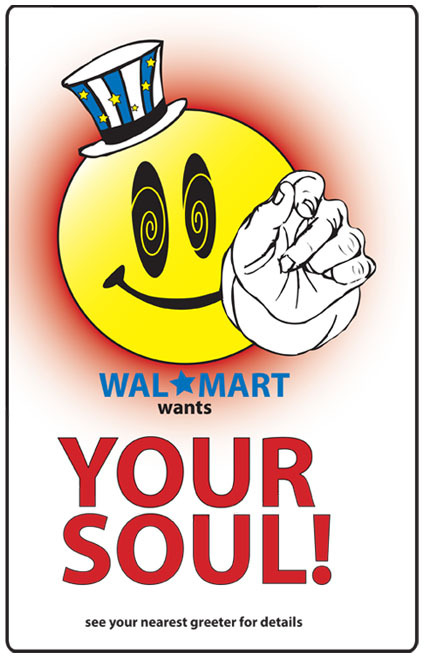 They are the Devil of retail, the Waltons will have a special pit in Hell someday. The reason doesn’t matter, as long as you’re boycotting. I’m glad for the solidarity, and couldn’t agree more! Well done, Pops! That’s a phenomenal lesson to learn. I’m a big fan of supporting local myself. And hope Audrey loves her well-earned kicks! She willingly paid a little more money for a clean conscience. I couldn’t ask for anything more!